Sandton, Johannesburg. Over 550 women gathered at the Sandton Convention Centre to celebrate and share ideas on best practices in achieving gender balance as part of the global call for gender equality. Amongst the women and some men in the audience were women from business organisations (namely IWFSA, the Black Business Council, 30% CLUB, Business Unity SA, Advancement of Black Accountants of Southern Africa, BWSASA, Young Global Shapers), as well as rural women’s organisations, women in sports, women in media, leaders of tertiary institutions, queens, university students and 40 grade 12 students from various schools. 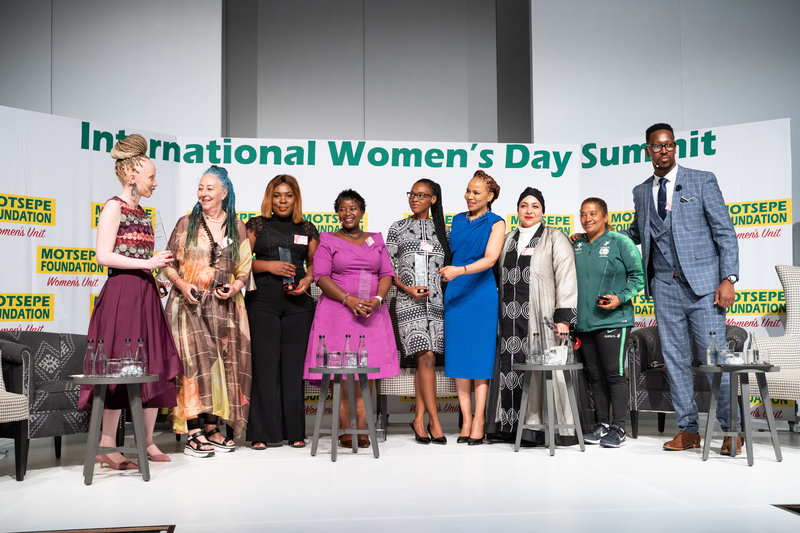 Dr Precious Moloi-Motsepe, who had earlier returned from ringing the bell for gender equality at the JSE said, “The International Women’s Day Summit is an important day in the calendar of Motsepe Foundation activities. We believe that we all have a meaningful contribution to make in ensuring a gender balanced world”. In his powerful keynote address, Chief Justice Mogoeng Mogoeng challenged women to become more deliberate and intentional about their course for gender equality. “Why does it look like women are being accommodated instead of being recognised for their excellence, the leadership capacities they possess, and the good work they have displayed…? Driving gender balance, gender equality, fighting gender discrimination is a collective responsibility. The question needs to be answered by all of us,” he said. The two panel discussions held at summit raised numerous issues including: a lack of data in the private and public sector; the importance of visionary and determined leadership; and the need to combat socio-cultural ills that influence toxic performances of gender. The Women’s Unit invited ten High School learners from Kwa-Zulu Natal, Eastern Cape, Mpumalanga, Limpopo, North West and Gauteng, whose essays on gender equality were selected out of 200 submissions. The two winning essays (attached) were read by the students to the audience and received rousing applause. All 10 contestants were awarded a Motsepe Foundation bursary, an unexpected prize, guaranteeing each of them a chance to further their studies at any of the South African university. The Motsepe Foundation bursary covers tuition fees, accommodation, textbooks and meals. In addition, two winning schools received R50, 000 each as a contribution towards books for their libraries or access to digital publications. For the first time this year the Women’s Unit also introduced the Shining Light Award, honouring women for their courage and persistence in achieving greatness within their chosen fields of work or careers. “What we do at this summit together, every year, is spread a message of power. There is power in inclusion and there is power in collaboration. Including women in decision making and leadership positions is the smart thing to do, both in terms of inclusive growth and eradication of poverty, but it is also morally the right thing to do,” said co-founder and CEO of Motsepe Foundation, Dr Precious Moloi-Motsepe. Aligned to the United Nations Sustainable Development Goal 5 – for gender equality – the Motsepe Foundation Summit is solution-driven in its aim to spark national dialogue, recognise individual agency and form action-orientated partnerships. The Summit ended with an eye-catching fashion show, organised by African Fashion International (AFI). Women led brands, AFI Privé and Khosi Nkosi showcased their latest collections alongside David Tlale and Orapeleng Modutle. Fashion is an industry that is sustained by women, who are the majority employed along the supply chain. Appreciating luxury is an ode to the women around the world who work in sweatshops creating fast-fashion without decent wages or government protections. The event incorporated elements of the 4th Industrial Revolution by live streaming for online engagement and participation, and an electronic signature board in support of the Women’s Unit #CountMeIn campaign. #CountMeIn is a commitment made by men and women to end all forms of discrimination in the work place and to ensure diversity and inclusivity in all political, economic and social spheres. The Motsepe Foundation Women’s Unit would like to thank SABC3, W.Beauty Woolworths, Microsoft, UN Women, McKinsey, Fynbotec and African Fashion International for their support in making this summit a remarkable success.